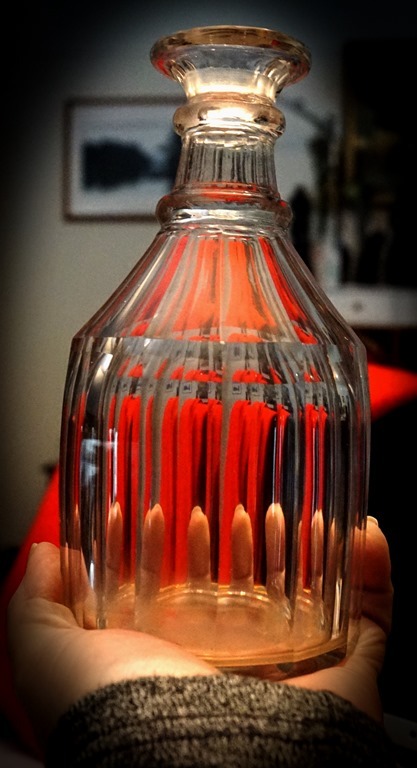 One hand, one decanter and way too many fingers. Sustenance for All. 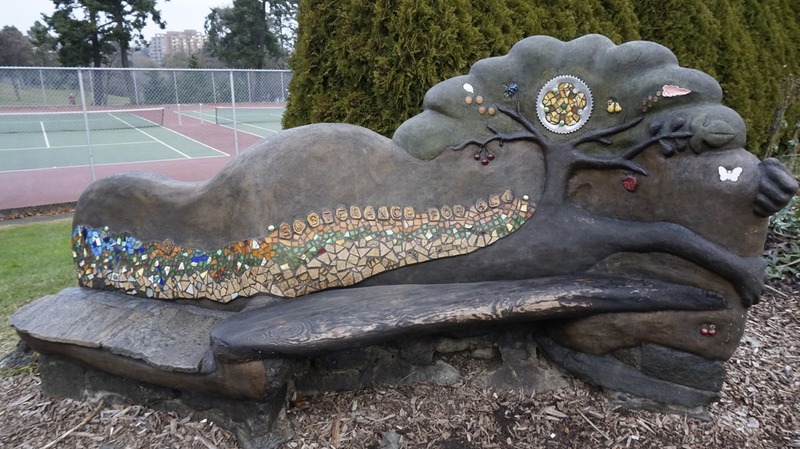 This is bench made by the community for the community! 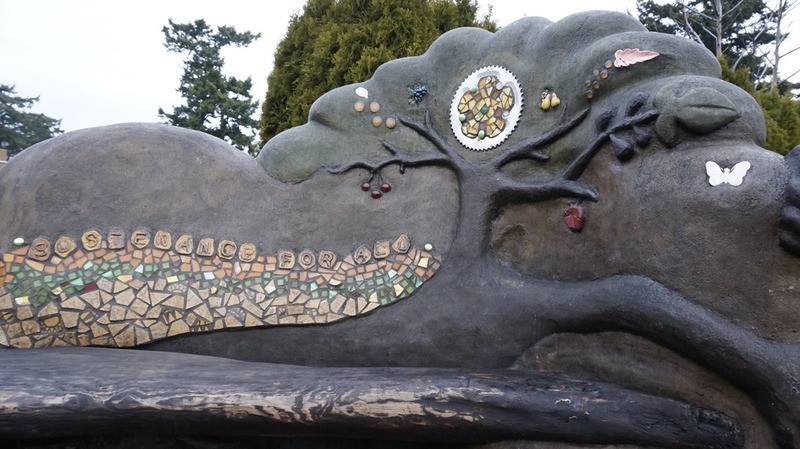 The bench is a cob cement creation with bits of wood, stone, glass, pottery, plastic, and other foundling to entice the viewer. 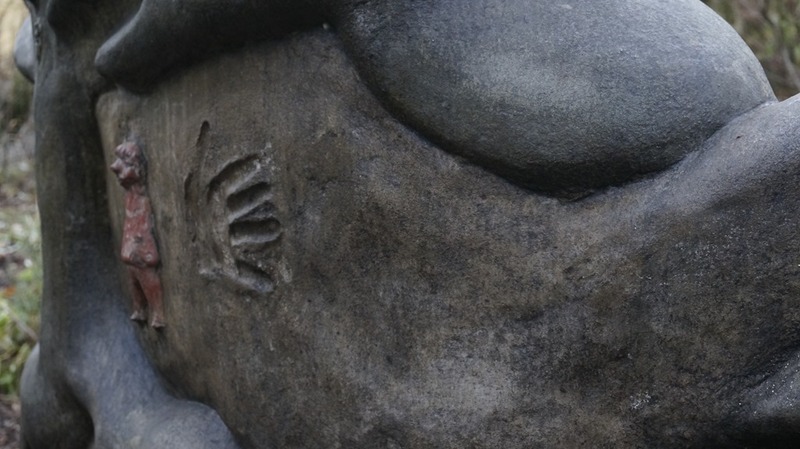 The community makers sculpted on the back an Otter and hands to hold the sitters. 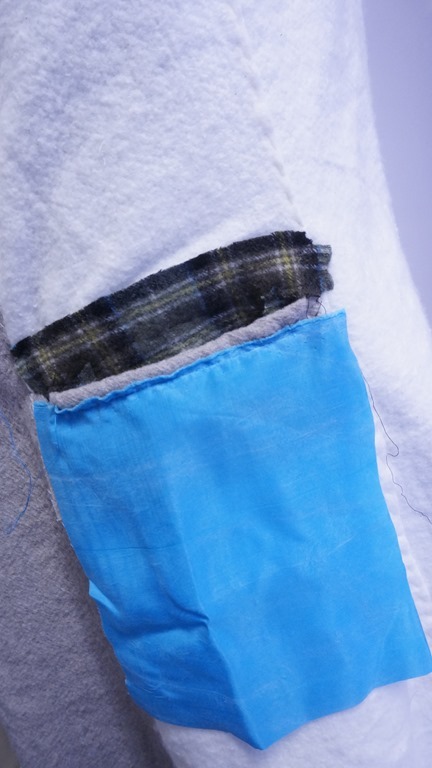 The pockets are in place and the lining is now attached in every way. Now just to finish the edges. Thanks for looking. 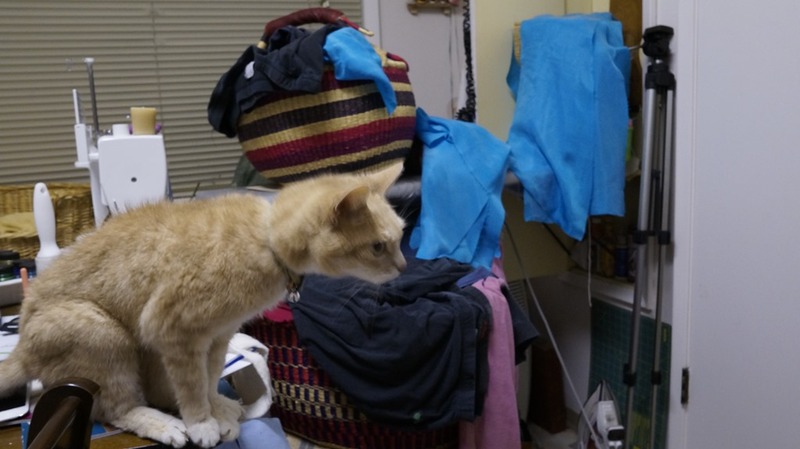 the cat trying for the warmth of the coffee machine! This photo is the best color of the silk lining. 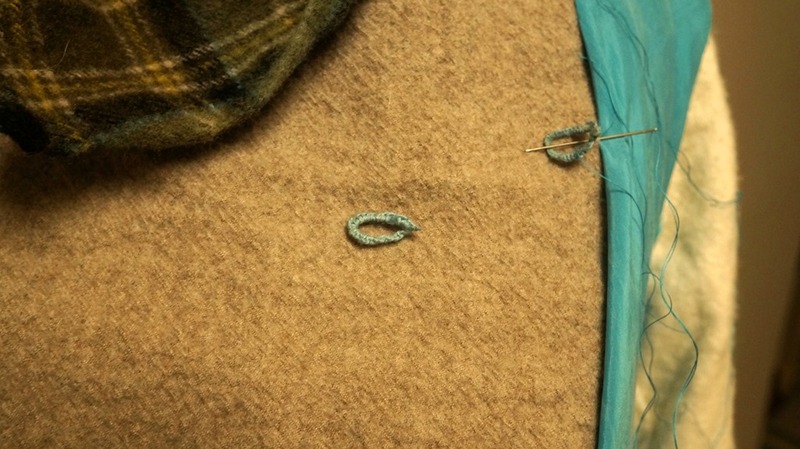 Hemp thread closures for the inside hooks. 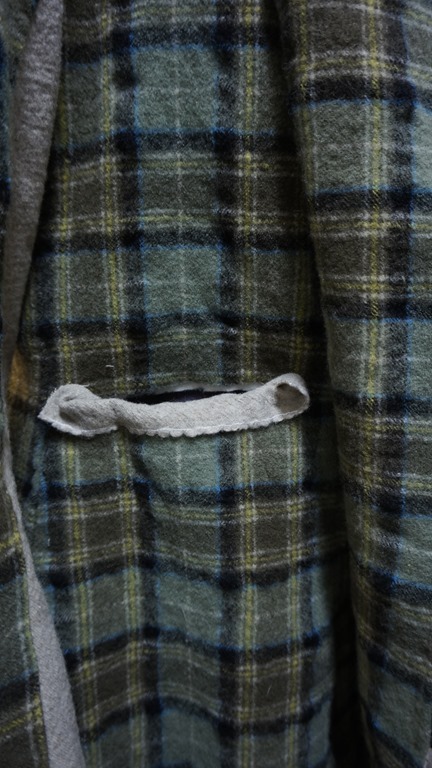 Basted: The washed wool winter coat. 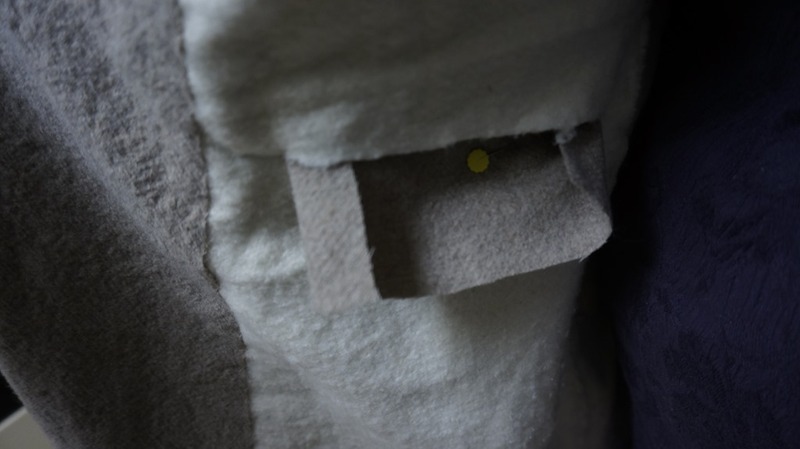 Basted: My washed wool winter coat. The beginnings. 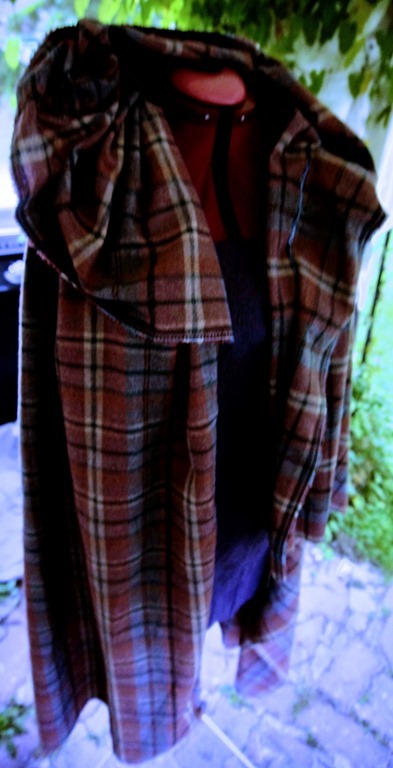 The washed wool was a 4 meters of wool plaid found at the thrift shop for 10$. I washed it in hot sanitize cycle of my washing machine with the bath mats and slippers! 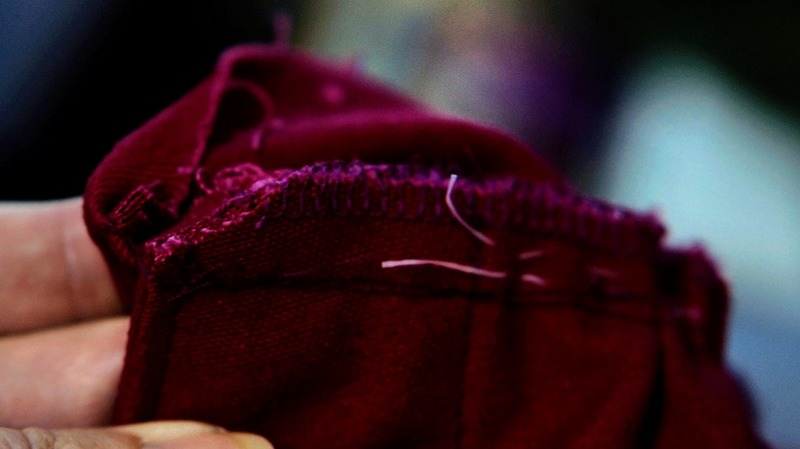 This was done over two years and the material stuck around in the stash. I suspect that this winter will be cold and that I need a proper warm coat. 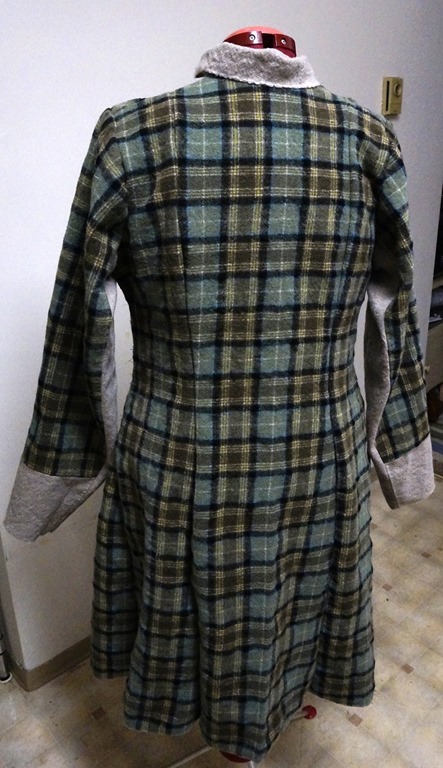 For the pattern, I am using the 1912 traveling coat. 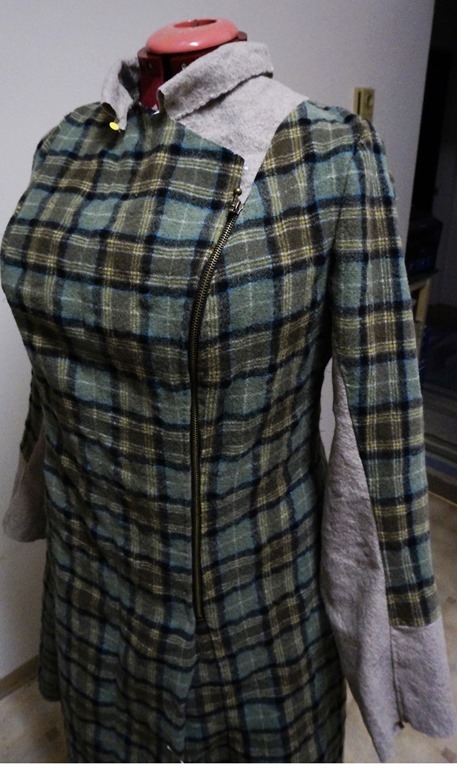 https://austerity101.wordpress.com/2012/08/08/now-for-my-jacket-2/ I really like the princess cut of the pattern. 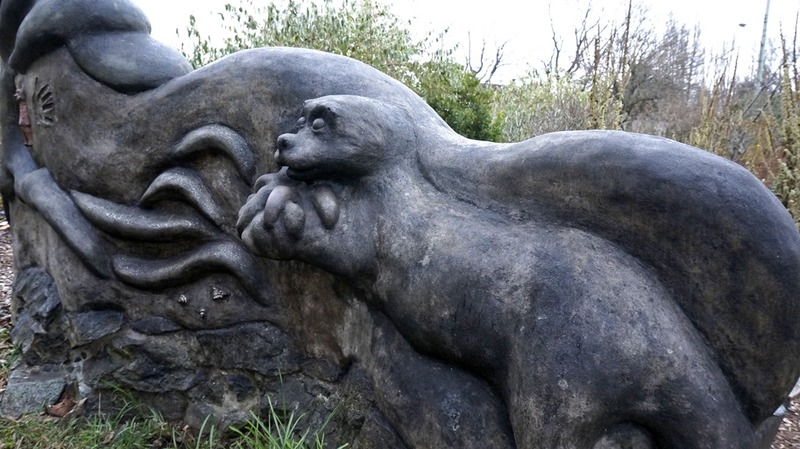 It is easy to meld into my shape. As I added greatly to the length to bring the coat to just above my knees I found that I was a bit short. 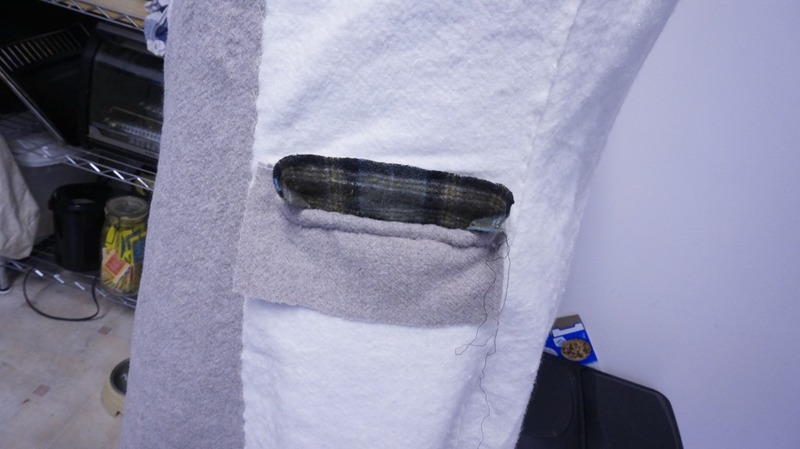 So the under sleeves and front under panel are in the natural wool. 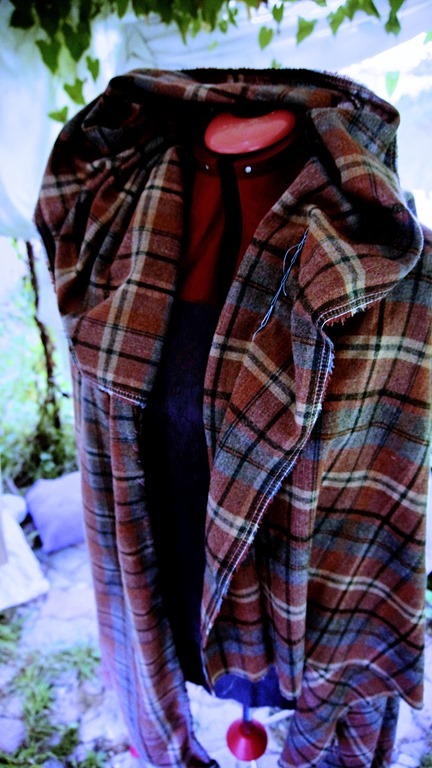 The coat will comprise of the washed wool in plaid and a natural wool also picked up from the thrift shop for a few dollars and washed the same as the plaid over time. 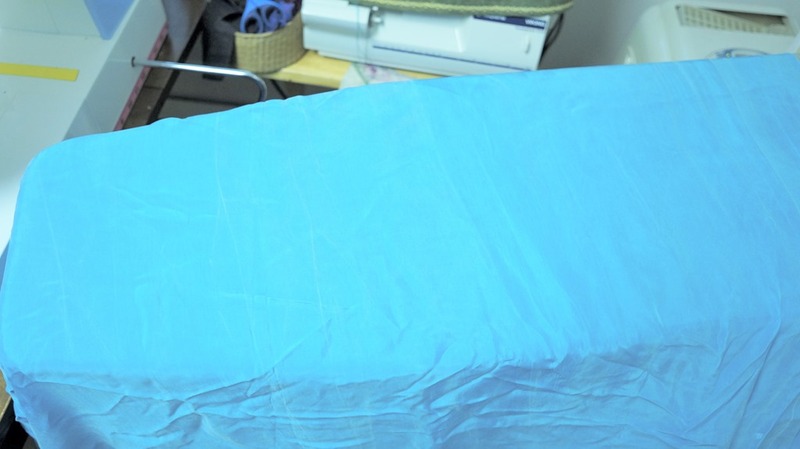 I purchases some quilting cotton batting for the inner layer for warmth. 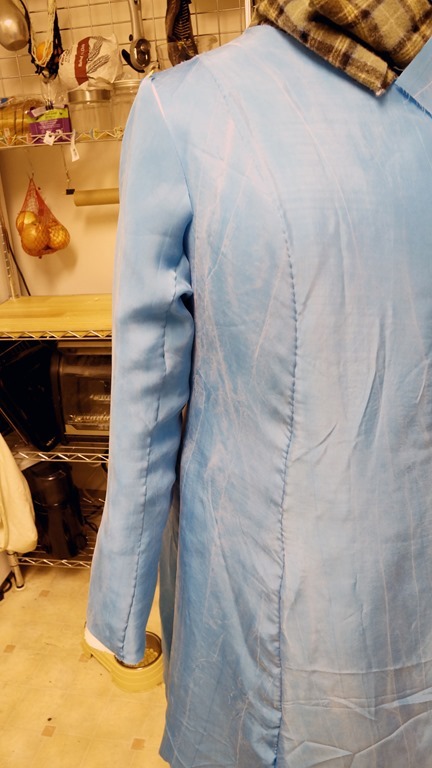 The lining will be in blue sand washed silk. Again, a thrift shop find of 6meters for 20$. 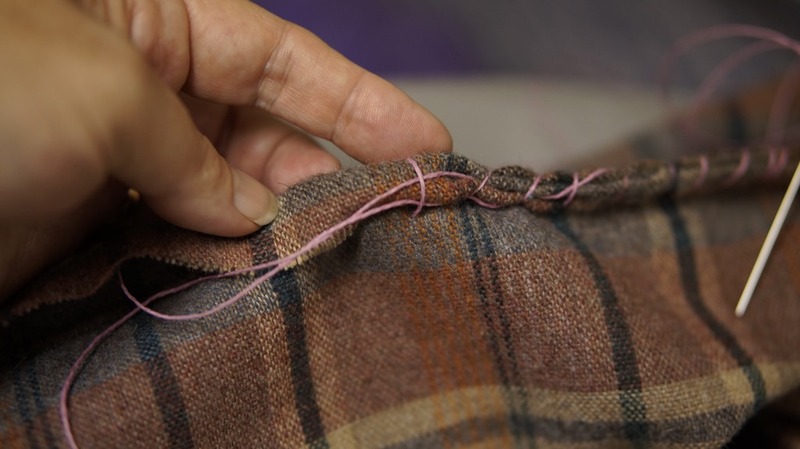 When I put the cut wool pieces together and sewed them on they shifted. And that was with the walking foot in full gear! 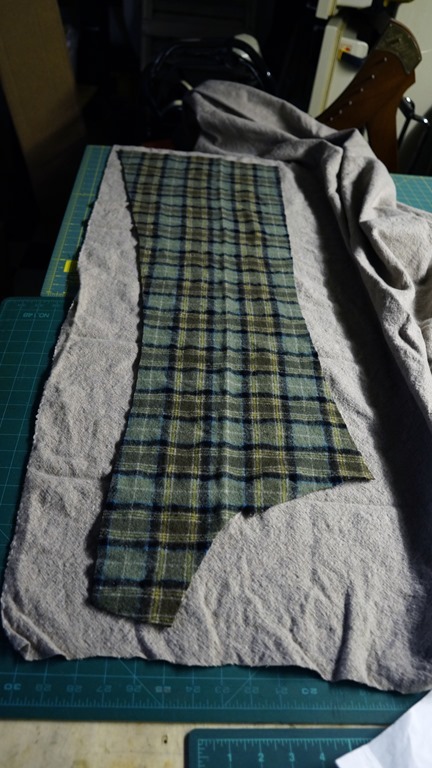 So, I pulled each seam apart and hand basted each seam so the plaid now matches at all seams. 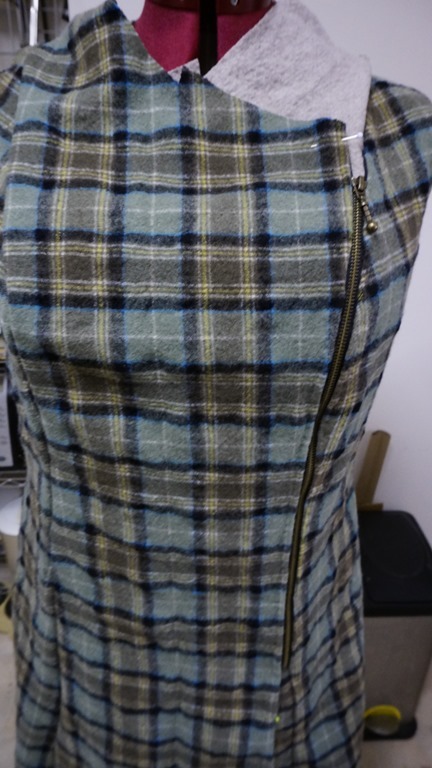 The front opening is by zipper on the left side. Again this was had picked into place and topstitched by hand to keep it there. 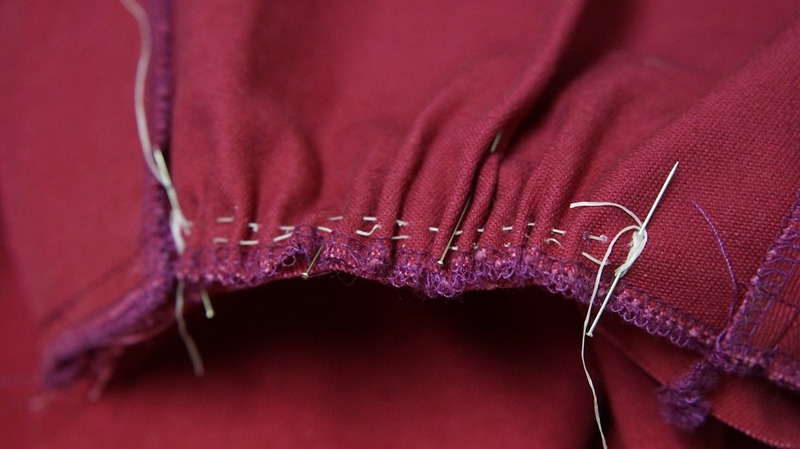 So before I can add the interlining and lining, I will topstitch by hand all seams. 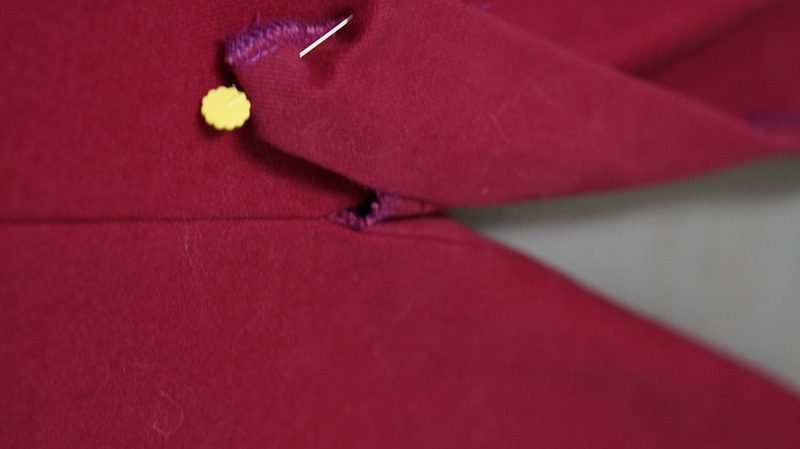 This is to seal each seam with the overlap. 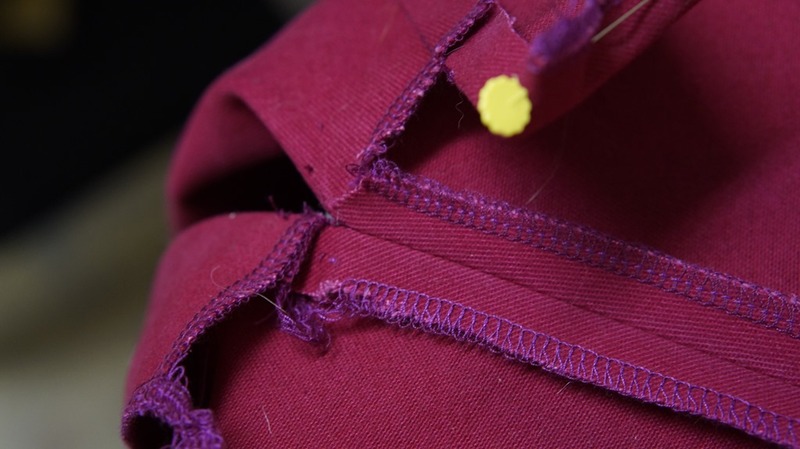 It will add bulk that will be hidden once the interlining is in place. Then I will steam the seams. 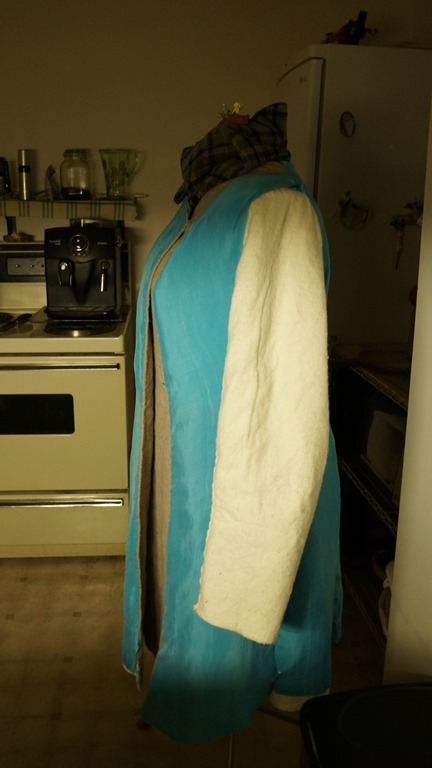 Then on to the interlining, lining, hood and cuffs. This is a fun skirt to make. 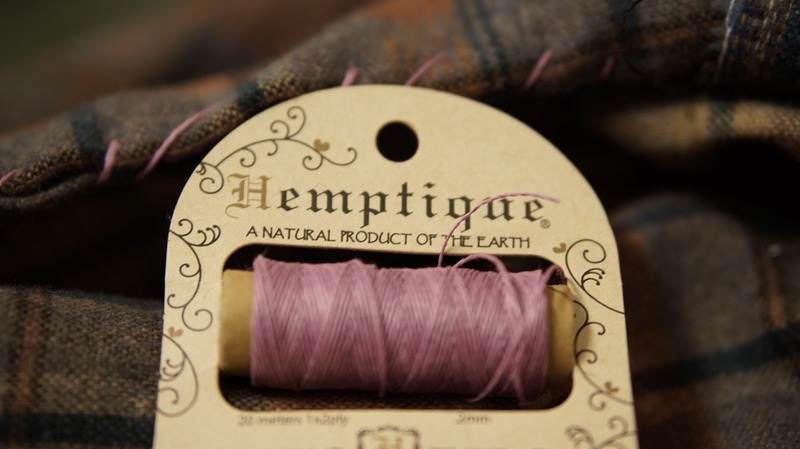 I have several that I wear – one in hemp summer cloth for summer and two in wool for winter. My partner found for me some red denim that has a velveteen brush like finish on the right side. Total cost $4.00 for the skirt. The tread was given to me and the closure was a find at a thrift store in a bag of buttons and such. The material is not part of the recommended list as it is normally too heavy but this is just a bit lighter than the regular denim so I went ahead with the cut. 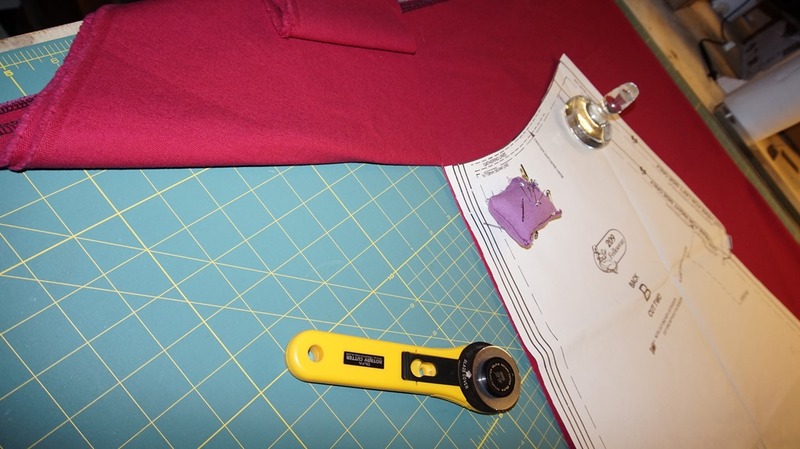 The pattern is an easy sew except for the placket – it can be tricky. 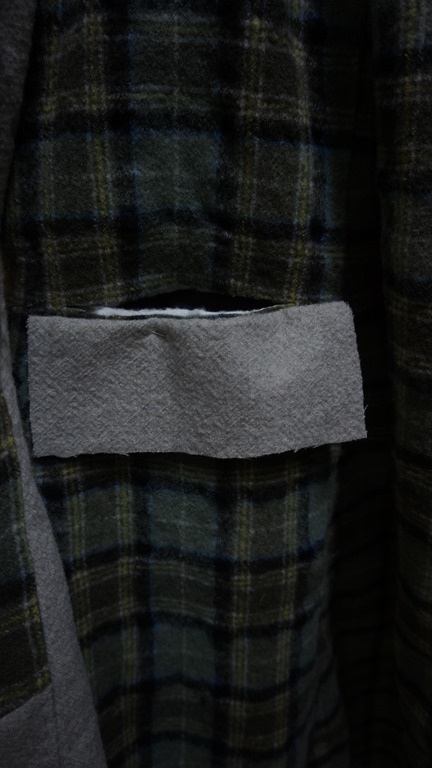 Here is a close up of the back seem just below the placket opening. 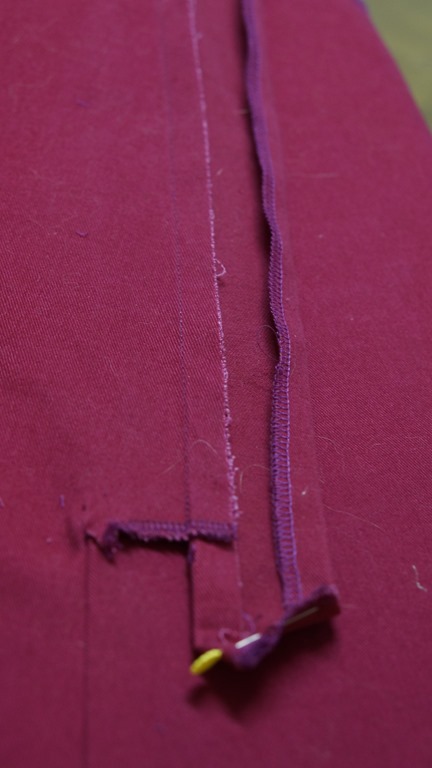 The placket sewn to the extending flap, showing the opening , and a placement of where it will go on the back panels. A small clip is needed for the opening to function properly. This is the trickiest part of the construction. 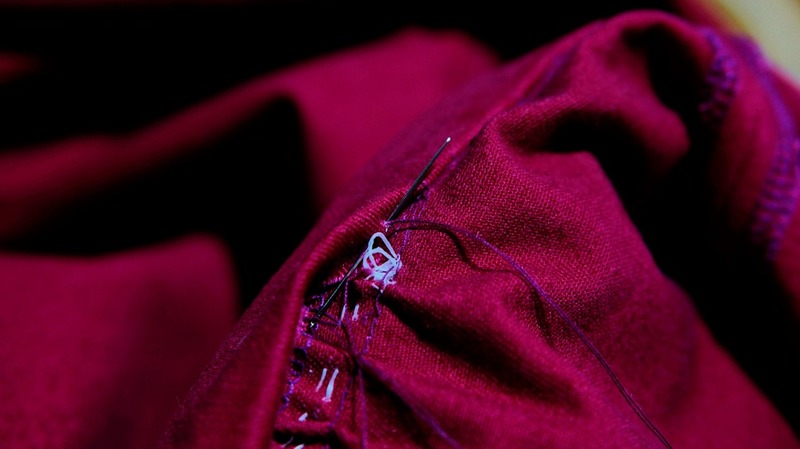 Attaching the bottom of the placket to the skirt while maintaining the top stitching on the placket itself. 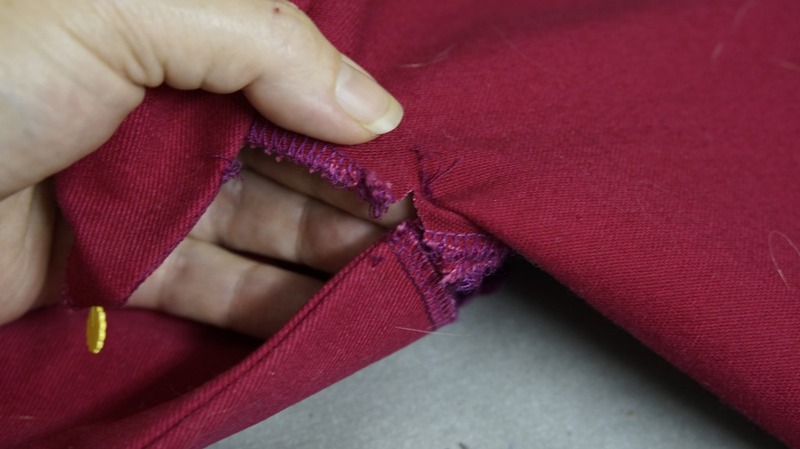 The placket in place – I was not happy with the placket as it buckled at at the bottom opening so I ripped it out and cleaned it up. 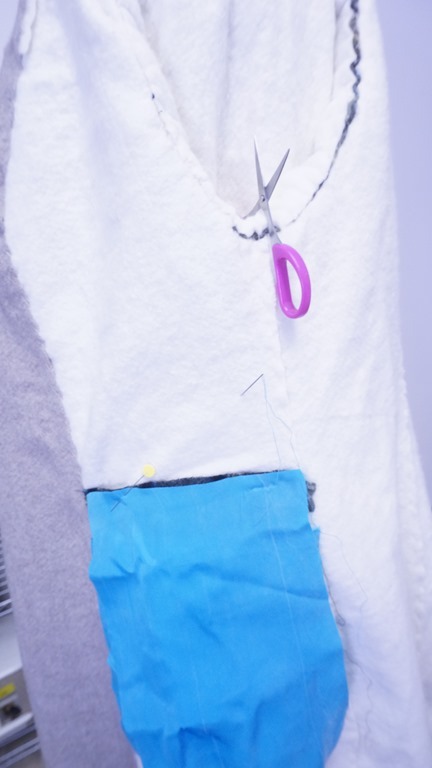 Once finished only one button or in this case the hook will be necessary to secure my modesty! 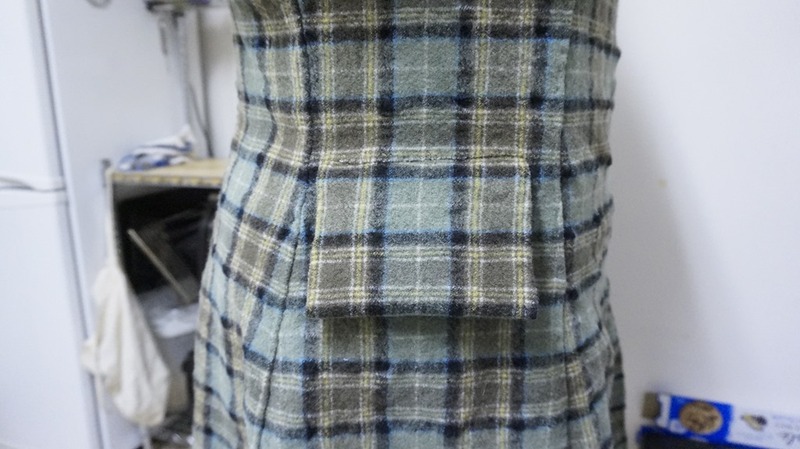 In this shot above I have the back pleated but the end result was an overly large back side on an already large lady so I removed the pleats and inserted a gather as per the instructions. To gather heavy material – use dental floss! 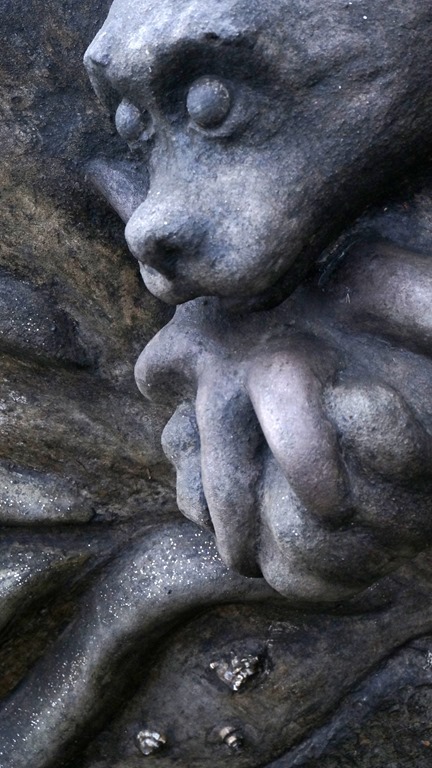 It holds forever and doesn’t break under the weight. 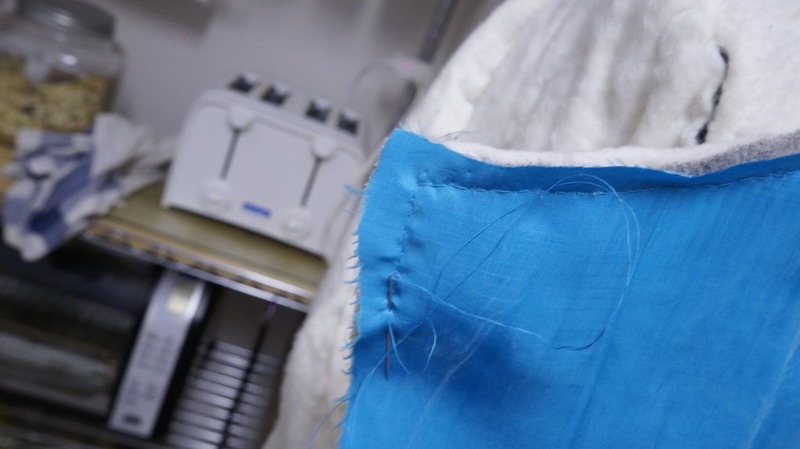 I secure one end with a pin and pull so that I have an even texture along the line, baste to secure and ensure that there are no unsightly folds in the seam. 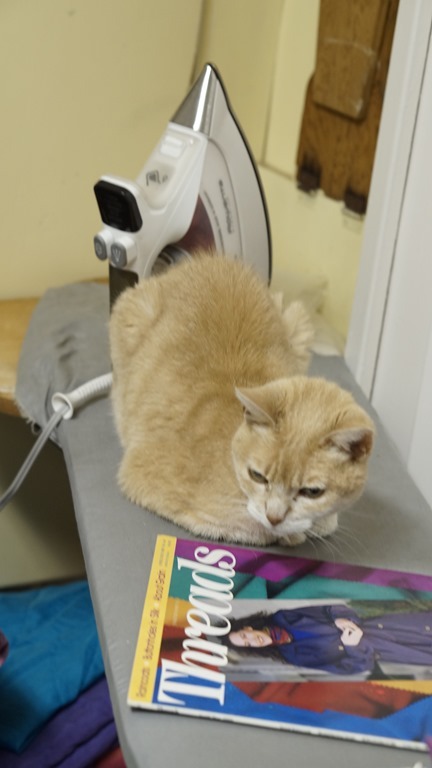 Gentile has taken a liking to the ironing board and she is as stubborn as she is old so it can take a bit to get her to share the space! 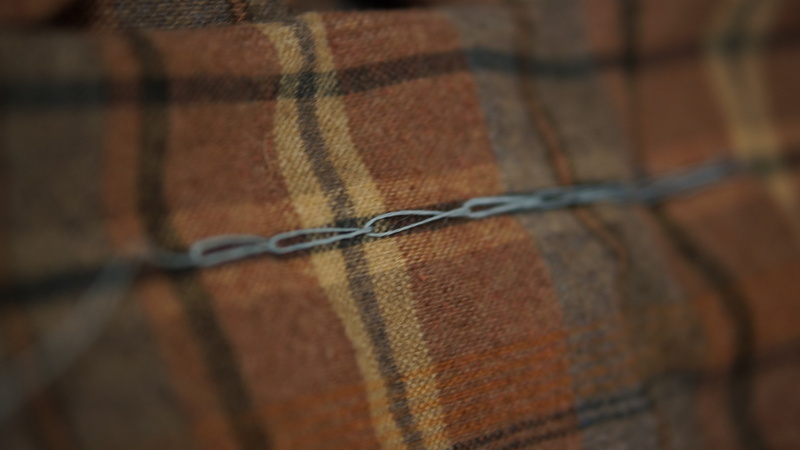 For all of my waistbands I insert an elastic band the width of the finished band to keep the waistband from folding when I sit. 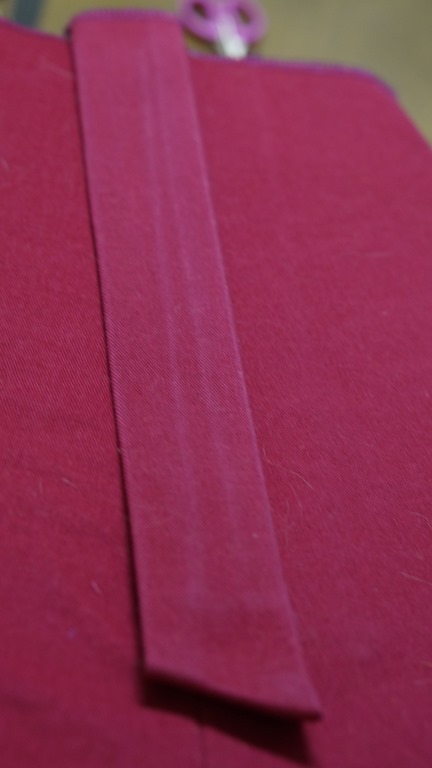 This allows for a long wearing waistband with the right amount of firmness at all times and no unsightly folds. 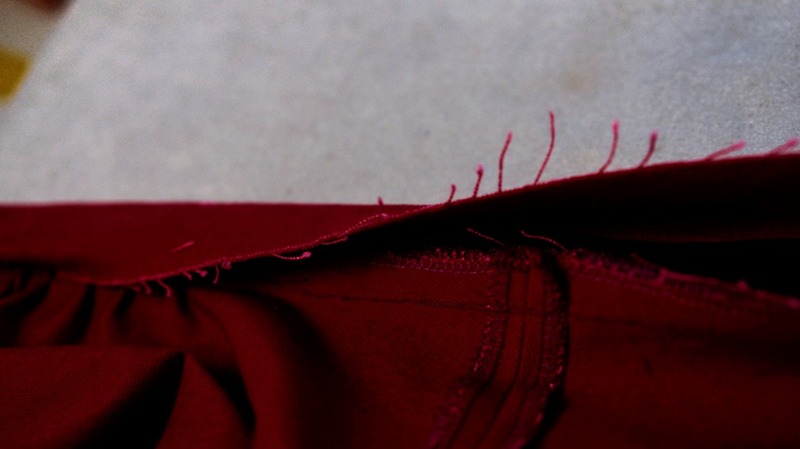 With the waistband secure, I moved on to the hem. For a rare change, I actually ironed my allowance up. Normally I just turn on the sewing machine and away I go. 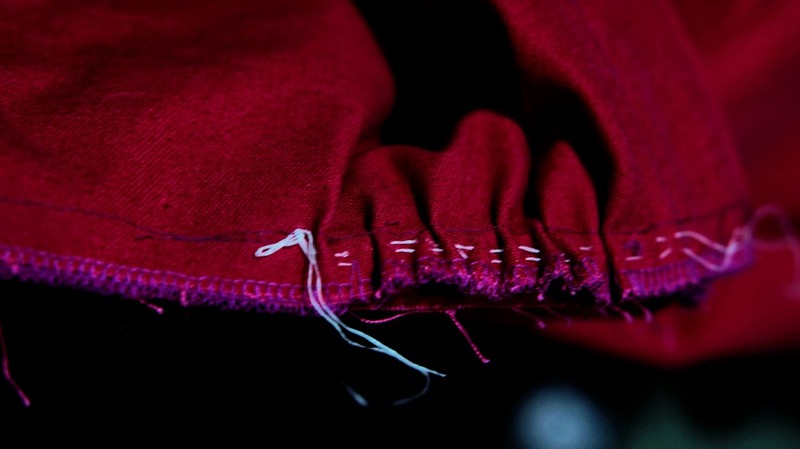 As it is denim and with the a straight stich on a denim hem has an annoying habit of turning up, and this can very hard to iron out.. To stop this I did an embroidery stich over the hem. 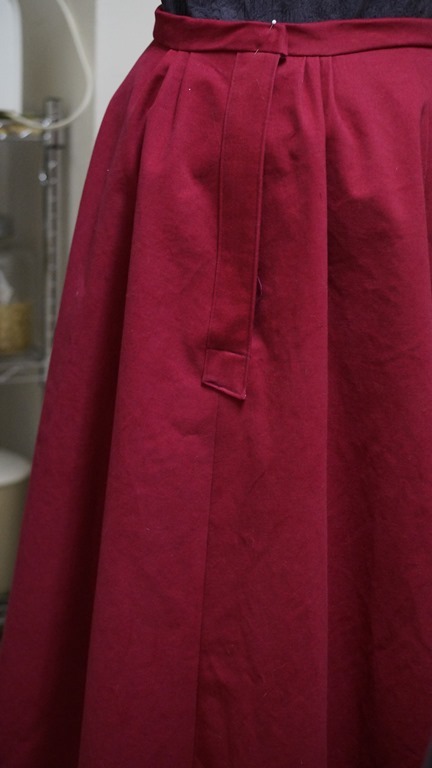 It adds color and dimension to this very red skirt and will keep the bottom smooth. 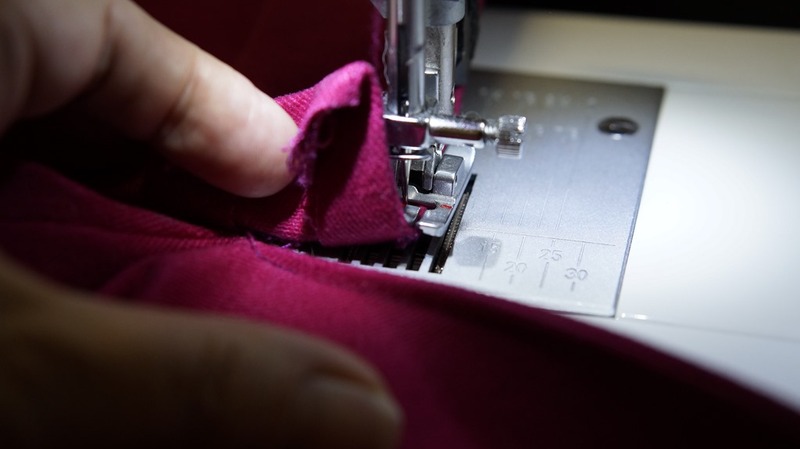 thanks for taking the time to read about my adventure in sewing. 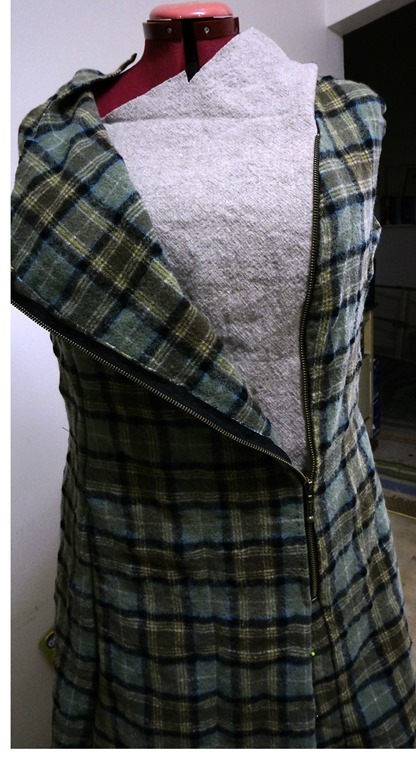 Cape idea 2 – from a single piece of fabric and some hemp thread! Cape 2 from a single piece of fabric and some hemp thread. 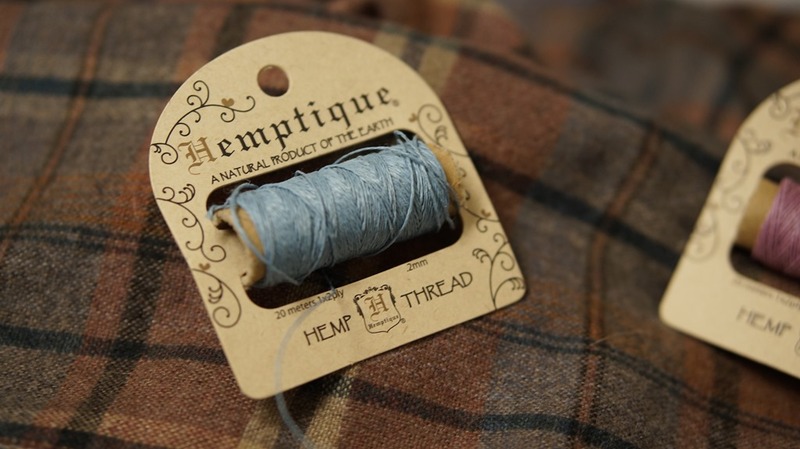 Hemp Thread – yes Hemp! It is .2mm and I think too big for my machines so hand stitching is in order. 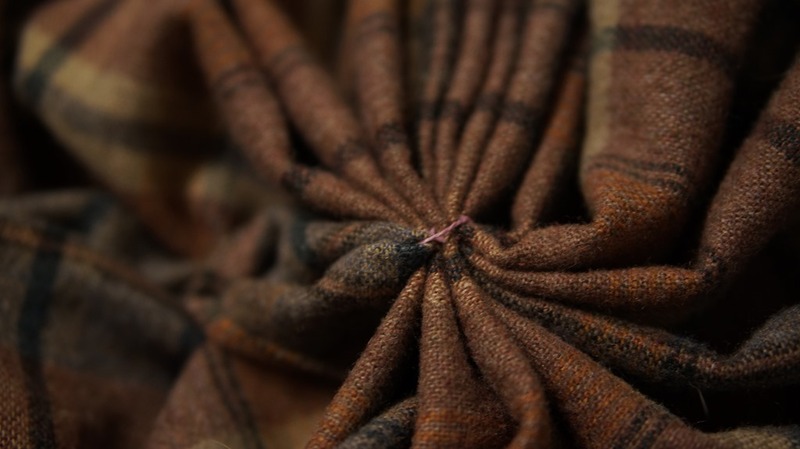 Recently purchased wool plaid from the thrift store was begging to be a wrap. It measured 172cm long and 155 wide. 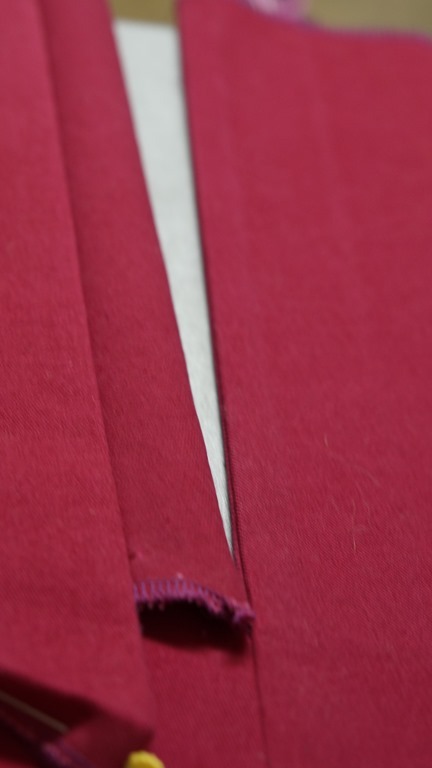 So, I started to fold at one corner 8 inches ( I use both metric and imperial in my sewing and cooking – it comes from starting my school years in imperial measurements and having to learn metric in middle school) from the raw edge and folded to the count of 10. Secured it with some pink hemp thread As this is only a test, I hand basted the raw edge of the plaid with more pink hemp. 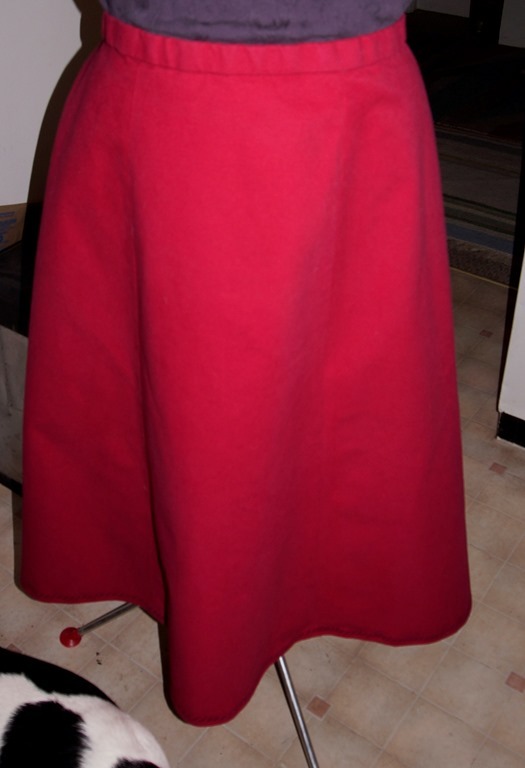 Then I got another Idea and it was not to pleat the left side but to bring it up in a swanky way. 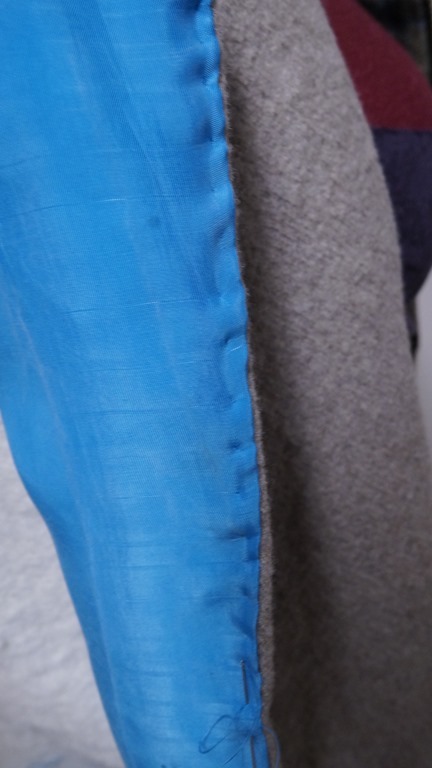 To complete it I did a fast chain stitch on the left side to keep the folds in place for the drape of the hood. 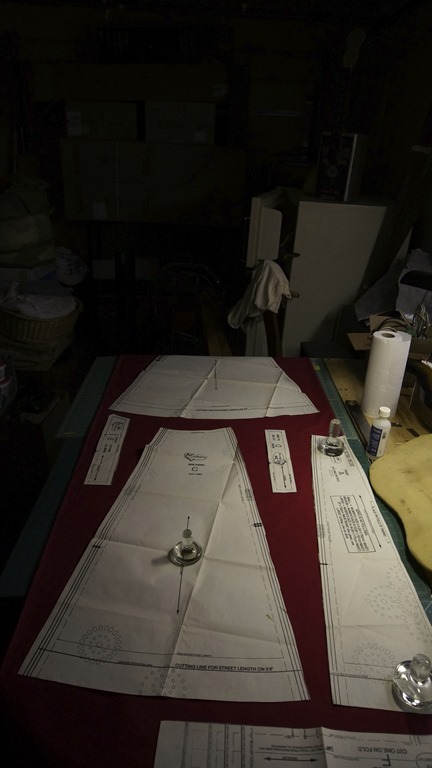 The beginnings of a cape. It is asymmetrical but has a nice look. 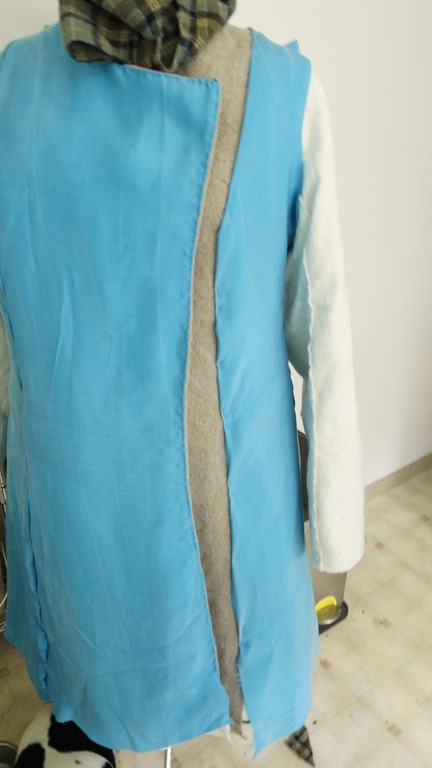 To finish this, I need to baste the bottom hem as it is the cut side of the fabric, craft an opening for the right hand and imagine a closure for the front. But should I take the time to finish it or rip it apart and make a skirt? Or pants, or vest? you get the idea. Feedback is always appreciated. 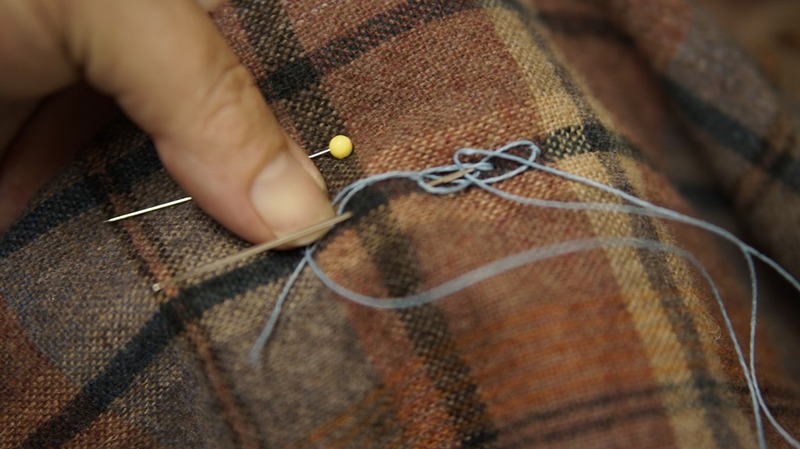 I have already started a new one but it is only pinned. 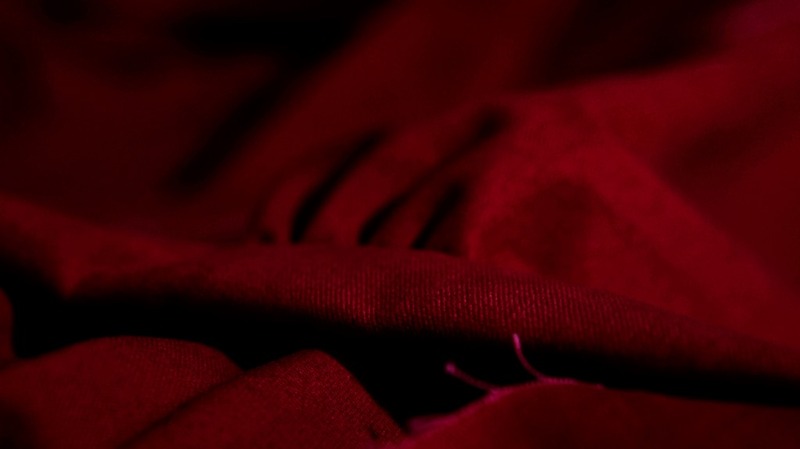 It is a dusty rose-pink from the 80’s, a woven silk with a very nice drape. 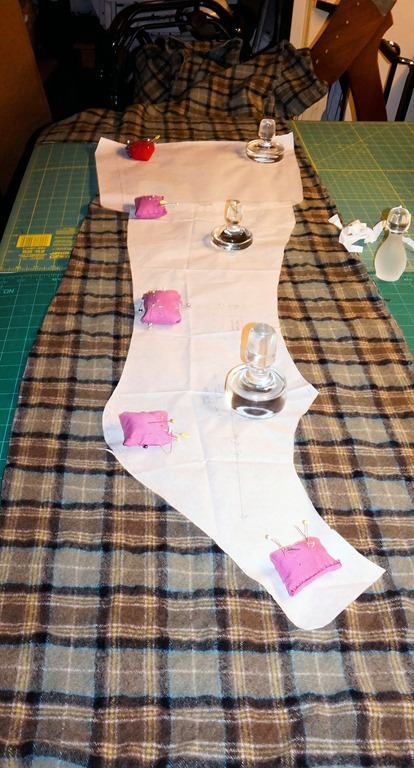 It is my next part of the little sewing no cutting capes that bellow from my fabric stash.